In the early 1980s, a trio of college students, all pilots, decided to satisfy a long-held desire to design and build their own airplane. Jeff Viken and Alan Klapmeier were roommates at Ripon College in Wisconsin and Dale Klapmeier attended the University of Wisconsin, Stevens Point. 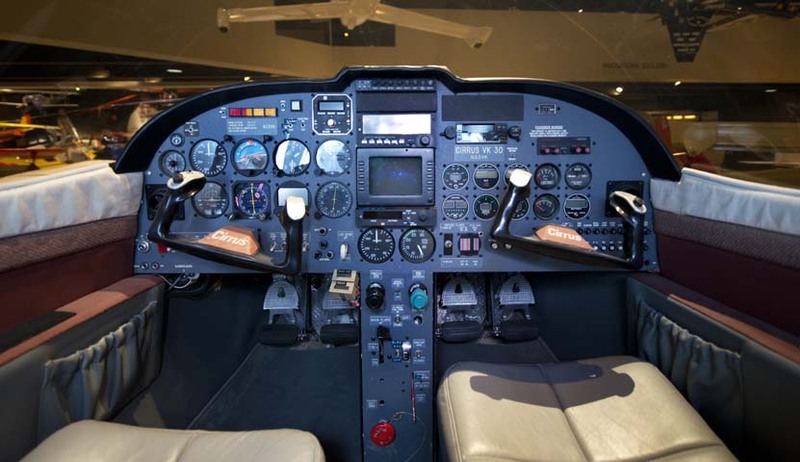 During those college years, they spent countless hours at the Waupun and Princeton airport and lots of time brainstorming about their airplane. Once they reunited after college, the three friends combined their knowledge and formed Cirrus Design Corp. From this collaboration came their first homebuilt design: the VK-30. 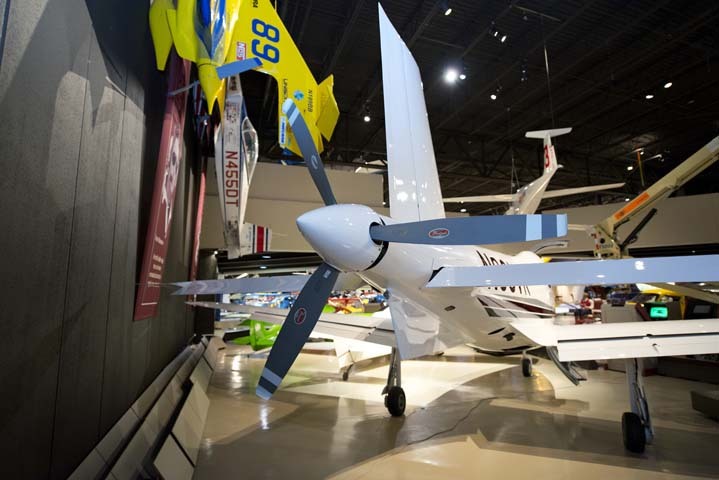 To achieve maximum aerodynamic efficiency, Jeff used his knowledge gained at NASA Langley to incorporate natural laminar flow for the wing, tail surfaces and the fuselage. Jeff’s wife, Sally, joined the group and designed the single slotted Fowler flap system, a key to the aircraft’s performance. The pusher configuration was decided upon to avoid propeller blast from drumming on the large windshield designed for maximum visibility. They frequently sought help and advice from longtime EAA member and Aerocar designer Molt Taylor who had been working on and writing about pusher designs for more than 40 years. The Cirrus VK-30 is unusual because of its size — the cabin is bigger than other homebuilt kits and can accommodate five people in comfort. The design progression began with the dimensioning of the large cabin, followed by the lofting of lines around it, both in side view and in planform, from a pointed nose back to the tail mounted prop. EAAers first saw it as a static display at EAA Oshkosh 1987. The VK-30 in the EAA Aviation Museum collection, serial No. 5, is the first production prototype upon which all kits were based. It was the company demonstrator and appeared on various aviation magazine covers. Jim Patton flew the test flight on February 11, 1988. Cirrus estimates that 13 VK-30 kits have been built and flown. 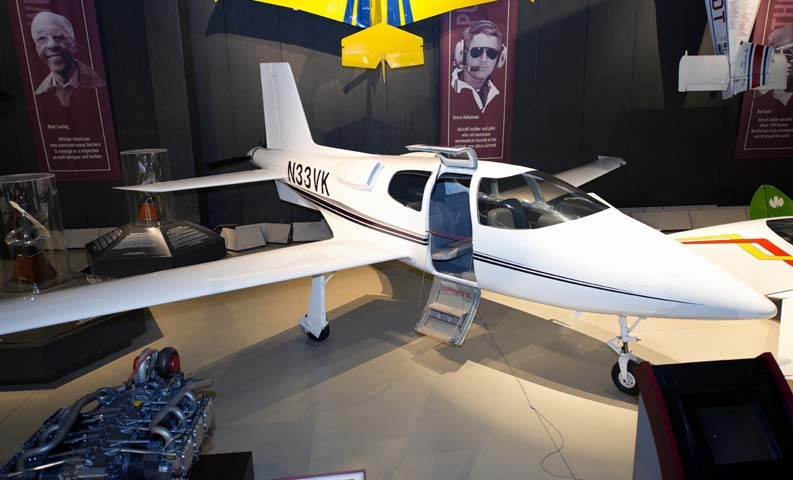 The airplane was donated to the EAA Aviation Museum by Cirrus Design in 2005.